They have now received national recognition for this new way of evaluating cooperative purchasing in government settings. The Arizona Capitol Chapter of NIGP recently adopted a new form to help school districts, cities, towns, counties and other municipalities justify the use of a particular cooperative contract. The Justification for Utilizing a Cooperative Contract was reviewed by the Cooperative Committee of the Arizona Capitol Chapter of NIGP with the input from a host of public procurement professionals across the State. The intent is that the document be used as a template starting point and edited as appropriate by the agency. This form can supplement due diligence documentation to further document the reasons for using a cooperative contract versus going out to bid independently. Is there a Cooperative Purchase Agreement allowing use of the contract? Was the procurement done by a Public Procurement Unit? Do the terms, conditions and scope of work/specifications meet the need? If no, are the terms, conditions and scope of work/specifications negotiable? Does the cooperative contract provide the most advantageous solution? Why? Is the contract in effect and in force for all proposed purchases? Will any and all purchases comply with the terms and prices in the contract? Will volume pricing advantages be applied to purchases? Are there any fees associated with use of the contract? Are they reasonable and justified? Were local and regional vendors offered the opportunity to compete for the contracts? Did the cooperative or lead agency have the expertise, reputation and history of quality contracting for the good or service being procured? Was past experience with the cooperative or lead agency acceptable? Is it a unique purchase that is better serviced under another contract? Is the item urgently needed? What is the age of the contract? How many years is it into its contract term? Michelle Hamilton is the Director of Purchasing for Mesa Public Schools, serves on the AASBO Executive Board and may be reached by email at mlhamilt@mpsaz.org. Bill Munch is the Executive Director of Procurement Compliance, Outreach and Education with Valley Schools Management Group and may be reached by email at bmunch@vsit.org. 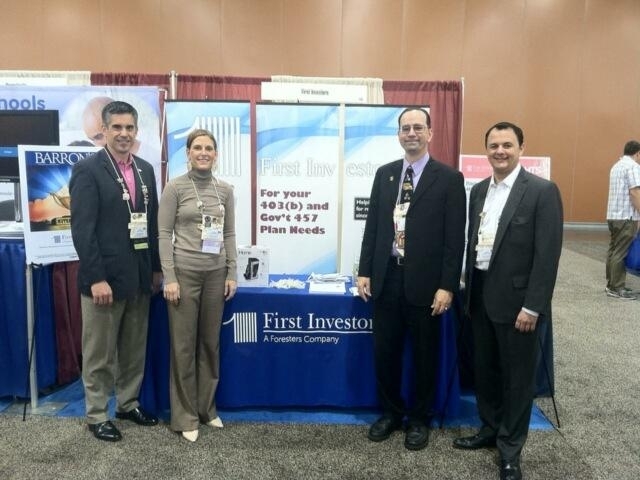 Left to Right – Matt Donaghue, Brenda Carlson, of First Investors, Bill Munch of the Valley Schools Management Group (VSMG) and Dennis Snoozy with First Investors. Special thanks to the Arizona Capitol Chapter of NIGP for sharing this resource with all NIGP members!